It has been a long time coming. The fifth and final (full) book from the Lunar Chronicles was preordered and I was completely and utterly besotted with the cover (the HARD cover!!!!) before it released and I knew I had to get it–in hardcover versus my favored paperback with this series (there are usually extras in the paperbacks). There is another book of short stories coming out, but Winter is the last full book in the series–and it is hefty at just over 800 pages! 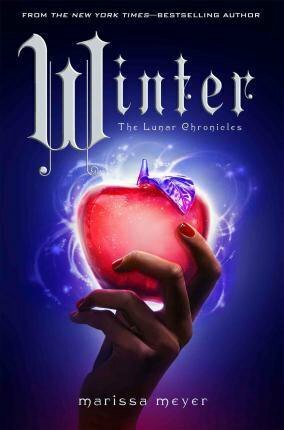 Readers of the popular series already know that Winter is the Princess of the Lunars, her stepmother Queen Levana rules Luna with an iron fist. The Queen is out to find the cyborg, Cinder (Princess Selene, the rightful owner of the Lunar throne), and her rag tag group of rebels that want to save Prince Kai and overthrow Levana’s cruel regime. But on Luna, a beautiful Princess, more than just a little crazy, sits in wait. She feeds prisoners and helps anyone she can get to–she is gorgeous, but hides the scars that line her face. Levana, knowing that Winter is more beautiful than she, and more loved than she, realizes she has to make an example of Winter, if only so she can redirect the people’s attention to her upcoming nuptials to Kai and make certain no one knows of her plans to invade and destroy Earth, as well. But when the rebels get too close to Luna, and are reported to have landed, Levana arranges for Winter to be killed. But the beloved princess is spared by one of the Queen’s guards and escapes with one of Cinder’s allies with the hopes that they can regroup and stop Levana before it is too late. I loved this book so much. I had anticipated it for too long, I was worried that it would not live up to my expectations. It did, and then some. Rather than give away anything, I will say this–readers of fairy tales will recognize this as a retelling of the Snow White story, but a little loosely-based. Take that with what you will. Also, the ending is another nod to some awesome fairy tale ‘rules’ and I really liked how Meyer switches between people. The characters are well-written and developed and I really enjoyed reading what happens to them as the book progresses. It is really hard to believe that it has only been a relatively short span of time in between the time we meet Cinder in the first book until the ending in Winter… I await the short story collection (coming out in February) so I can read more–including a story including Scarlet’s Grandma! Winter is available in Hardcover, ebook and audio formats from your favorite retailer! I have some catching up to do before getting to Winter, but I am looking forward to reading it. I am glad to see that the series ending delivered what you were hoping for. I didn’t know about the short story collection that is coming out. Yay for hearing more about Scarlet’s gran!